Imagine a halibut measuring nearly eight feet long and weighing 364 pounds — then imagine yourself trying to reel the powerful behemoth up from the abyss and and hauling it onto the deck of your small boat. That’s the story of George Levasseur and his three partners in the summer-long Valdez Halibut Derby. Levasseur, who caught the monster fish over the weekend, has shattered the derby record by 21 pounds, holds a commanding lead in the popular competition and has stuffed his freezer with a year’s supply of delectable fillets. But it’s the memory of the battle — not the prize money or the fillets — that will remain with him the longest. The Pacific halibut struck a large iron fishing lure with a herring pinned to its hooks at a depth of 170 feet, far into the Gulf of Alaska. The fish ran every which way but refused to come up. It required the strength of all four anglers, using its rail as a fulcrum, to help Levasseur pump the rod upward and reel during the downward motion, to gain line. Fortunately, derby rules allow this type of teamwork. The fishermen eventually saw the massive oblong white sphere materialize at the surface, whereupon they fell back in awe of its size. The fishing line had snapped and the harpoon was pulling free of the flesh, so a second harpoon was hurled into the fish, and a gunshot ended the struggle. All four men wrestled first the head, then the rest of the fish onto the deck. They then heaved a collective sigh of celebration and relief. “I’ve done a lot of fishing and that was the most exciting moment of any fishing trip I’ve been on,” Levasseur continued. The group returned to an awaiting crowd and learned the weight of the fish. Though it shattered the derby record, it’s not the biggest derby fish caught during area competitions. In 1996, a 376-pound halibut was caught during the Homer Jackpot Halibut Derby. Fish this large are rare, and given the nickname “barn doors.” The biggest non-tournament halibut caught by an angler was more like the side of a barn. It weighed 459 pounds and the 1996 catch, made outside Dutch Harbor, Alaska, remains the International Game Fish Assn. all-tackle world record. 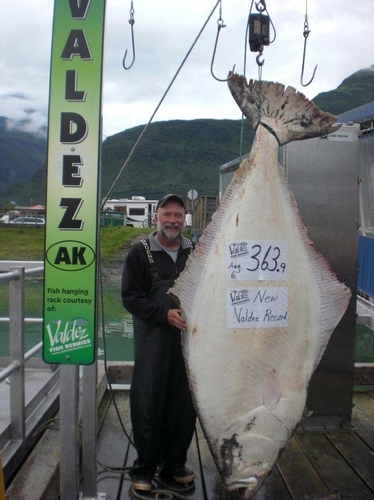 Lavasseur must wait until the end of the Valdez competition, on Sept. 5, to see if anyone can beat his catch and claim the $20,000 first-place prize. That will be a tall order — at least eight feet tall.